The cake is called banh giay (glutinous rice cake), a type of snack of the Nung ethnic people. When buying the cake, it is wrapped in dong leaves. A 49-year-old banh giay vendor identified as Phuong from Na Hoi Village said she has spent half her life making and selling the cake. In the harvest season, Phuong works in the rice field but in the between-crop period, she works at the market as a cake vendor. 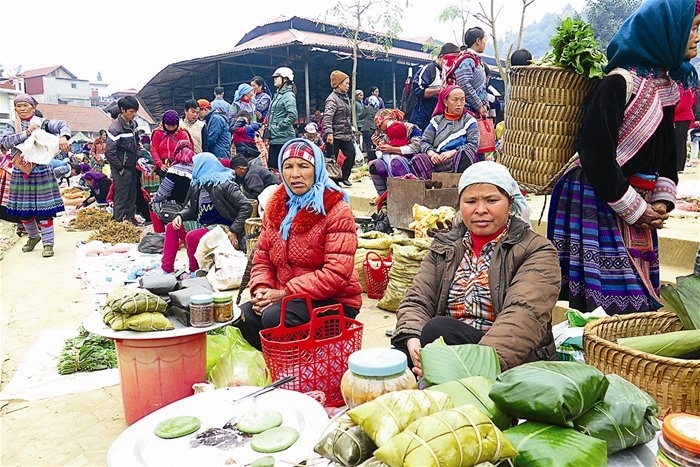 Every day, she sells seven kilos of banh giay and earns enough money to continue work in the field, which has been passed down through many generations of her family. According to Phuong, the cake is made from simple ingredients including sticky rice, sesame and sugar, and it is the soul of the cook that makes the cake delicious. A bite of the sweet and fragrant cake can keep one warm early in the morning at the market. Banh giay should be eaten when it is still hot.